After completing his series of photographs commissioned by C.H. 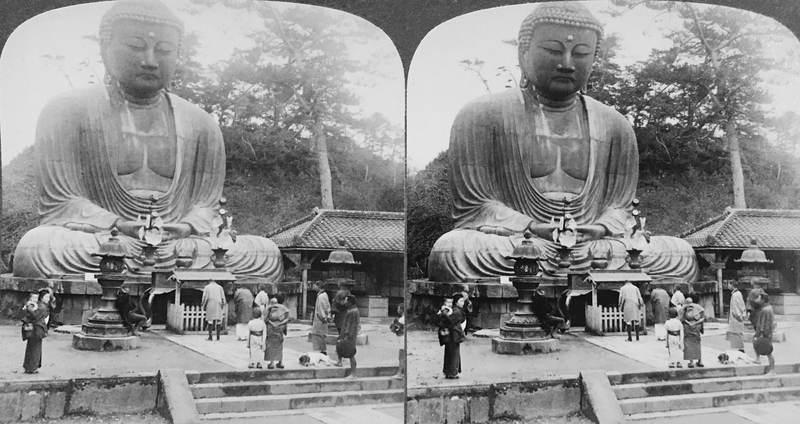 Graves and the Universal Photo Art Company, Herbert George Ponting (1870-1935) was hired by the premier publishers of stereoviews, Underwood & Underwood, in 1903 to take new stereo-photographs of the scenery of Japan. These new images would replace the older series by Henry Strohmeyer, which was already almost a decade into its profitable run. For this set, Underwood & Underwood would expand the total number of views from 72 to 100, bringing them up to pace with their competitors who were enlarging their Japanese portfolios. Ponting was in Japan (or it neighboring regions) from spring to late fall 1903, and his images were published on the now-standard slate-colored mounts in 1904. By the end of his stereo-photography career, Ponting would have produced more images of Japan than any other Western stereo-photographer, having shot eight separate volumes of 100-view sets for an array of publishers in the first decade of the twentieth century. His reminiscences of his stays in Japan were published in 1910 as In Lotus-Land Japan, not surprisingly illustrated by copious amounts of his own photography. The casualness of the worshippers, dressed in a variety of loose-fitting garments, and the presence of the resting dog reassert some of the mundaneness of the scene. Looking more closely, we can spot a young man reclining on the base of the left lantern, adding to the sense that the viewer is actually peering into the daily temple environs. The caption brings attention to the “majestic calm” of the Daibutsu, asking the viewer to recognize the serenity of the setting, despite the small crowd of worshippers looking frozen in their spots. The photograph and its accompanying caption strike a balance between highlighting the wonder of the statue and the religious activities of Japanese commoners. In addition to the multi-lingual captioning on the reverse side of the card saved from its 72-view predecessor, this set also included a lengthy description and history of the scene depicted on the obverse (some variant editions lack this description, however). By opening with a second-person form of address (“You are about an hour’s ride by rail…”), the readers are immediately transported into the role of a globetrotting tourist making their way through the foreign terrain of Japan. The three-dimensional effect of stereoviews combined the stylized point-of-view of the description all act to make the beholder of the card a truly virtual tourist. The descriptive account employs ample amounts of pathos, drawing upon nostalgia for the “old times of mediæval splendor” and nuanced detail of the craftsmanship of the statue, highlighting the value of the “solid gold” eyes and “pure silver” ūrṇā. In form, this does not differ greatly from the genre of guidebooks and travel account narratives, of which many readers would likely be familiar. The description ends with comments on Japanese religious practice, and directs readers to Lafcadio Hearn’s (1850-1904) Glimpses of Unfamiliar Japan, first published in 1894 and which had become a popular seller. Title/Caption: Great Bronz [sic] Buddha, Kamakura Japan. For more detailed information on Ponting and the publishers Underwood & Underwood, see Bennett 2006. It was not uncommon for stereoview publishers to sell the rights of their images for used in other printed venues. Half of Ponting’s stereoview, for example, was used in Clive Holland’s Things Seen in Japan, published in 1907, (pg. 215). This stereocard can also be viewed here. As described by Thomas Tweed, Hearn was a romanticist, focusing on the exotic, aesthetic, and literary dimensions of Buddhism, see Tweed 2000. This would be a natural fit for the middle-to-upper class consumers of stereoviews, who would have shared many similar sentiments. Bennett, Terry. 2006. Old Japanese Photographs Collector’s Data Guide. London: Bernard Quaritch Ltd.
Tweed, Thomas A. 2000. The American Encounter with Buddhism, 1844-1912: Victorian Culture and the Limits of Dissent, Revised Edition. Chapel Hill: University of North Carolina Press.